As others have noted, all Skype for Business Online tenants that are capable of PSTN calling are now able to create their own custom dial plans. This allows administrators to create custom normalization rules for local and extension dialing and other cases the default normalization rules don't handle. Dial plans work a bit differently in Skype Online than they do in on-premise deployments. In on-prem deployments, dial plans are completely independent of one another. 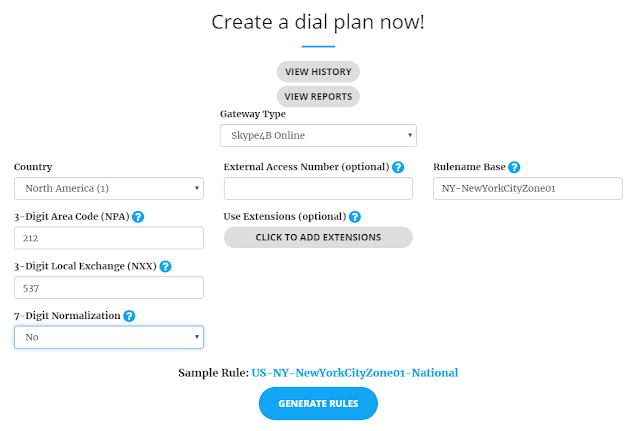 Users assigned either a specific site or user-level dial plan will only use the normalization rules contained within that dial plan. Normalization rules assigned at the global level do not apply. In Skype Online, users can be assigned to either a tenant global dial plan or a tenant user dial plan. As with Skype for Business on-prem, users will get normalization rules from the global tenant dial plan, unless they are explicitly assigned to a user tenant dial plan. There is no inheritance from tenant global to tenant user dial plans. However, users WILL inherit dial plan normalization rules from a Skype Online global dial plan specific to the country where their phone numbers are hosted. This is the default dial plan that all users are assigned to in the absence of a tenant global or user dial plan. If you look at the dial rules for other countries, you'll see the only difference between them is the long distance and international dialing prefix and the country code. I get that it can be tricky to maintain dial rules for 230+ countries, but hey if one simple Canadian dude can do it, couldn't Microsoft??? Aaaanyways, the global dial plan for your given country is applied along with any tenant level dial plans. It appears that the tenant dial plans are applied first, followed by the global dial plan for your country. This means you can use the Skype Optimizer to create more nuanced normalization rules that will work better than the default ones. You can't disable the global dial plan, so if a user dials a number not covered by your tenant dial plans, then the global ones will apply. So, even if someone tries to dial a completely nonsensical number such as 00000023423422348987987998770, it would get captured by the global Default normalization rule and would allow the user to dial that number. Of course, it wouldn't get far, but I would think that if you can prevent users from dialing invalid numbers at the client level, it would keep Skype Online servers from having to use precious system resources to parse that number and notify the user it is invalid. Just select the desired options for your country, press the Generate Rules button, and run the script. It will ask for your credentials for your Skype Online tenant and will then ask if you want to create a tenant global or tenant user dial plan. It will then apply said normalization rules to your tenant. That's all it takes! Buy now! Operators are standing by!